Castle Comfort Stairlifts offers top brand stairlifts, keen prices and fast installs for all those seeking stairlifts in Dunfermline, Fife. And all work comes with our no-quibble guarantees and famous customer service satisfaction. Dunfermline sits on the northern side of the Firth of Forth about 3 miles from the shore. There has been a settlement here since Stone Age times. However it didn’t come into its own until the Bronze Age evidence of which has been found in the area including a bronze axe, a gold torc in the parish churchyard. Bonze Age burials were also found nearby containing a bronze dagger, armlets and a necklace. Nowadays it is the second largest town in Fife after Kirkaldy some 15 miles to the east. Dunfermline is home to almost 46,500 people of whom about 9,000 are retired – and not all of them are the proud owners of Bronze Age treasures. Although some of them might feel as old as that!!! We know that about 235 of Dunfermline’s population already own stairlifts, that’s about 2.6% of the retired population, the national average. It’s a sad fact that a small percentage of us will need help getting up and down the stairs as we get older. Fortunately here at Castle Comfort Stairlifts we can help. We have a great supply of all the top brands of stairlifts at keen prices that we can install almost before you can say bronze dagger! What’s more our guarantees are second to none and our 24/7 customer service makes sure you stay mobile. It is Dunfermline’s Royal connections that gained its first acknowledgement. Malcolm III, King of Scotland married Saint Margaret in Dunfermline in the 11th century. It was Margaret who established a new church in the town which was later given Abbey status under their son David I.
Malcolm and Margaret had six sons and two daughters. Three of the sons became kings of Scotland: Edgar of Scotland, Alexander I and David I. Their daughter Edith who was also known as Matilda married Henry I of England whilst their daughter Mary married Eustace III of Boulogne. Margaret was an English princess, Margaret of Wessex. She was the sister of King Edgar and had been born in exile in Hungary. Having returned to England, Margaret fled to Scotland when the Normans invaded. Margaret was responsible for many charitable works including establishing a ferry across the Firth of Forth so that pilgrims could visit the Abbey. This gave South Queensferry and North Queensferry their names. Margaret was canonised by Pope Innocent IV in 1250. Her canonisation recognised her holy disposition and her work with the church to bring about reform and her charity work. She was interred at Dunfermline Abbey but after the reformation her remains were lost. Her feast day is now 16 November, the day of her death. The Abbey was established by Saint Margaret although in her and her husband Malcolm’s reign it was a church dedicated to the Holy Trinity. It was their son David I who established the building as a Benedictine monastery dedicated to the Holy Trinity and his mother. Today it is a Church of Scotland parish church. In David’s time its first Abbot was Geoffrey of Canterbury. Edward I of England held court here at the very beginning of the 14th century. The building was burned when he left although not all of it was destroyed. During the Scottish reformation in the middle of the 16th century much of the building was further destroyed. Fortunately much of its infrastructure including the refectory, rooms above the Gatehouse and the nave remained intact. A decade later repairs were made to the naive and this part served as a parish church until 19th century. It is now included as part of the new parish church. Abbott House is just to the north of Dunfermline Abbey and is a Grade A listed building. The heart of the building is 16th century in origin and is now a heritage centre showing Scotland’s history from early times right through to the 19th century. It is the oldest surviving building in Dunfermline and represents architectural changes from 16th – 20th centuries. You can still see frescoed wall paintings from the 16th century and a 14th century tracery window. Various historic specimens have been found in the gardens from pottery shards to coins. Another Grade A listed building, Pittencrieff house is now a museum. Originally built in the 17th century, two of its bedrooms now form two long galleries for museum and art space. A huge repair and refurbishment programme was only completed two years ago even restoring its original lime wash exterior. Pittencrief Park which belonged to the house was bought by philanthropist and son of Dunfermline, Andrew Carnegie. He donated it to the people of Dunfermline to enjoy at the same time as he established the Carnegie Dunfermline Trust for the local people. The weaver’s cottage where Carnegie was born before his family upped-sticks and emigrated to America is now a museum. You can see regular weaving demonstrations here. If you’ve had to hang up your dancing shoes, or throw off your football boots, we can still help with those stairs. Give us a call today to learn about reconditioned stairlifts, grants and 0% finance options, so that you too can be the proud owner of a first class stairlift and swish to the top or bottom of the stairs. 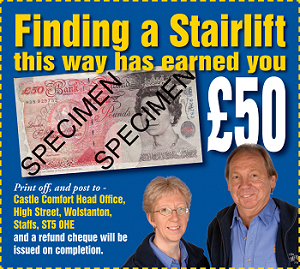 Once everything is set up we can install your stairlift in less than half a day and you’ll be mobile again. Don’t put it off, give us a call today on 0131 242 0046 .